John Butler Trio’s new album “April Uprising” is set to release in Canada and the US on April 6th. This album features a new drummer and a new bassist. If you saw JBT perform live in the last few years you most definitely saw him being backed by Shannon Birchall (Bass) and Michael Barker (Drums). They were amazing. While changing 2 out of 3 members of a group could potentially change things up a lot, when it boils down to it what is the John Butler Trio really about? John Butler. The Guitar playing, song writing genius that when I saw him live I felt like crying because i simply did not want the show to end. I have sat and watched him play “Ocean” on youtube over and over and over again trying to make it evoke those same feelings it brought on when i saw him play it live, but it never works. Seeing John live was amazing. There was nothing fake or fabricated about it. It felt like it was a show just for me. So while I would like to say and believe I’m a big JBT fan, really i’m simply a John Butler fan. The Trio can change all it wants i will follow John wherever he goes because i know the music will never change. New Drummer, New Bassist, same John Butler. 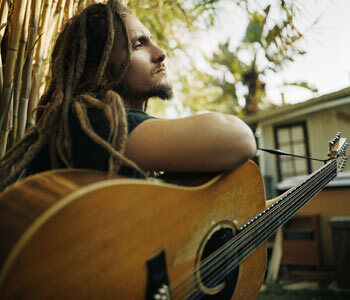 I think it is amazing how likable John Butler and his music really is. It has the appeal of it being part of a non-mainstream genre, while still providing the extremely catchy melodies and tunes that draw you in in the first place. It has sweet and sour sensation of providing that edgy rock sound supplemented with the sweet tang of acoustic ballad. And on top of this John’s musical talent cannot be denied. Personally I went through all kinds of phases of wanting to be just like John. I wanted dreads, i wanted to play the banjo, the harmonica, the dobro, I wanted to buy a 12 string and i even made a futile attempt to write my own version of Ocean (FAIL). Since then I’ve calmed down to a more quiet appreciation for his greatness. I no longer want to be exactly like him and i no longer go around raving about how amazing he is and how everyone should listen to him. I have his albums, and I listen to them, and i recommend you do too. One thing I find very funny about John Butler fans is that lots of them have this delusional idea that John Butler is somehow underground and act super surprised when someone knows who he is (It’s okay i was like that too). It’s because the genre of music that John plays is not mainstream, but the truth is John Butler is HUGE. His last album “Grand National” went triple platinum, and the album prior “Sunrise Over Sea” went 5x platinum. And that, for me, is one of John Butler’s greatest attributes. He’s so far from selling out that he makes you feel like your his number one fan. When you’re watching, it doesn’t feel like you’re watching a huge star who puts on a huge production. Its the bare bones. Its real music. Its three very talented dudes rocking out live, playing amazing music. And thus I simply cannot wait for his new album “April Uprising” to release and for him to come back to my hood. April Uprising has just come out in Australia. It’s pretty good but a lot rockier than his past stuff. The new trio does make a bit of a difference, especially Byron Luthier’s choice to play electric bass instead of double bass.